Life of a Catholic Librarian: Of fall socks & non-existent dance choreographies, it's a fun filled Wednesday! Of fall socks & non-existent dance choreographies, it's a fun filled Wednesday! Hi all! Very happy to be meeting with you at mid-week. We're getting there! And I'm in good spirits. I hope you are as well. Mike and I attended the open house at Anne's school yesterday evening. There was a big tree collage out in the hallway with all of the kids' photos on the leaves, and can I just stop for a moment and say that my kid is the cutest SO DARN CUTE?! :0 It's like when you have a baby, and when you look into the nursery, while admitting that ALL of the babies are adorable, you think to yourself, "Gosh, it's true what they say. I really DO think that my baby is the cutest one that ever was!!" She is CUTE, that kid. Henry's is next week, and I always love going to his school. At any rate, I've been knitting, knitting away! Crafters, I'm right, right?! Fall is the BEST time for crafting. When the weather is cooler, and you're indoors more, having wool on your lap as you work is just super cozy. I'm in a fall sock knit-along, isn't that just a scream? Mike thinks it's hysterical that knit-alongs are a "thing." They even have their own adorable acronym, KAL. "You mean, a bunch of people get together and decide to knit the exact same thing, on a deadline, and then gossip about it while they do it?" "Yep, precisely. Doesn't it sound fun?!" I suppose non-knitters would find this behavior odd, but it really IS fun. 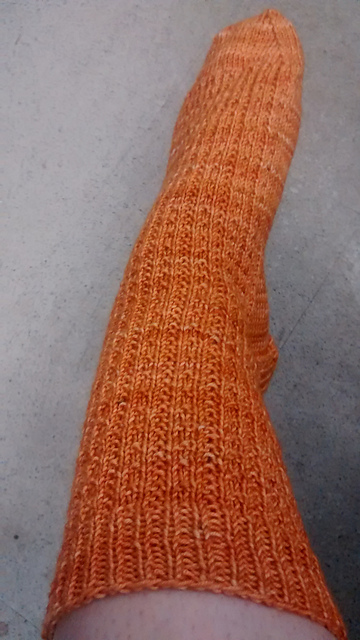 ;-) Our deadline is Halloween, and we're knitting patterned rib socks. I just finished sock #1! Pattern is Petty Harbor, and is a free download! Fantastic, yes? 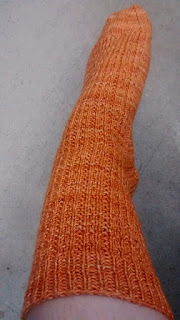 Of course, they're orange, how could they be any other color for a fall KAL?! Now I have to knit another one. Ugh. Do I really *need* two? In other news, I have a bunch of dance stuff coming up, the first event of which is the outdoor artisan's market again with my troupe this Saturday afternoon. I think it's supposed to be mild, so we won't have to worry about being too cold, which is good. Shivering doesn't actually help with the shimmies like one would think. ;-) So, we're doing a bunch of group numbers, and Claire's keeping the solos in there, and want to know something funny? I have a solo in there and I haven't touched my music since the art festival in late July. This, from the girl who, when she first started dancing, would choreograph BREATHING into my routines, lest I forget. In a sense, it's a good sign that I feel so comfortable within Middle Eastern dance that I can rely on my movement vocabulary for improvisation. But in another sense...TERRIFYING! We've got some other events coming up too, and, well... Let's just say it's going to be interesting. ;-) I tell myself that at the very least, it'll be good blog fodder, right? I'm just praying for the least amount of public humiliation possible. I don't even want to go into any detail ahead of time, that's how nervous I am. Which isn't exactly encouraging, but PRESS ON WE MUST! I will provide humorous details as they become available. What's happening with YOU this fine Wednesday, dear reader?